Hardwell’s Revealed Recordings has grown to become a popular dance music label. It’s released tracks such as ‘Never Say Goodbye’, ‘Countdown’, ‘Apollo’, ‘Spaceman’ and many more, from artists that include label boss Hardwell, Grammy Award winner Tiesto and Fatman Scoop and Faith Evans. The label continues to lay the foundations for the next generation including Dannic, Dyro, W&W, Blasterjaxx and Deorro, as it reveals its 5th birthday album. ﻿If you want ‘The Code’, ‘Daftastic’, ‘Bad Rule’ or ‘Arcadia’ as your favourite Revealed Recordings track of all time, then the label is handing over the reins to their fans by counting down their ultimate Top 100 Revealed Recordings releases since the label’s inception, taking pride of place across this anniversary album. 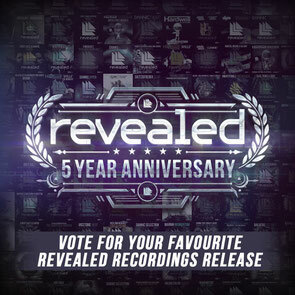 By announcing an interactive Top 100 where users can cast votes for their favourite Revealed releases at www.revealedrecordings.com, the label aims to put its fans in the driving seat with the chance to win some prizes including a one-of-a-kind Revealed merchandise box and two tickets to a Revealed live event of your choice. Voting is open now until 20 March.